This entry was posted in Favorite Perfumes, My Stats, Weekly Roundups and tagged 2012 perfume launch, Amber Absolute, Ambre Russe, Antonia's Flowers, №19, Bois des Iles, Bombay Bling, Chanel, Climat, Cruel Gardenia, Cuir de Russie, Dior New, Encens Mythique d’Orient, Ginger Ciao, Guerlain, Hermès, Lancome, Les Parfums de Rosine, Look 1947, Neela Vermeire Creations, Parfum d'Empire, Rose d'Amour, Tauer Perfumes, Tiempe Passate, Tom Ford, Une Rose Vermeille, Violet Blonde, Voyage d’Hermès, Yosh. Bookmark the permalink. ← A Postcard from Undina: Happy New Year! When I first started thinking about 2012, I was thinking it was not that great. In 2011 there were two fragrances that completely transported me that I hope to always have in my collection: Tableau de Parfums Miriam and Esprit d’Oscar. I have worn them so much this year. Miriam might be my most-worn perfume (I don’t keep track as well as you!). Then as I thought more about it, I realized that I may not have given some of the 2012 perfumes enough of a chance to really comment on how 2012 was in perfumery. I really want decants or bottles of Seville a l’Aube and Encens Mythique d’Orient (already went through a small decant of Seville). I also hope to get my hands on some L’eau de Chloe and Cartier Baiser Vole Extrait. I have a feeling if any of those perfumes entered my collection they would quickly be some of my favorites and worn very often. So, I think 2012 was a pretty darn good year of perfume! That DSH’s collection is definitely worth trying! I’ll get at least one of the perfumes. My big sampleof Encens Mythique d’Orient isalmost gone and I contemplate the purchase of the next portion – I just can’t figure out if I should go for the FB or do a decant. Do you know where it can be purchased at the moment? Seems like I’d have to try calling the Las Vegas boutique maybe? That’s where I’ll go if I decide to buy a bottle. I know that they had that collection. They are very helpful and nice. Thank you, sherapop. I was looking through all the posts and thought that those pictures would nicely illustrate my year. And I thought there were many great perfumes launched … you’ve covered a number of them here, so I won’t launch into a list. Here’s hoping you can keep your statistics going in 2013, but if not, you always seem to find something fascinating to write about. Your blog was one of my 2012 pleasures! Thank you, Suzanne, I really appreciate your support. I can’t complain about 2012 on any level as well but it was hard to many – that’s why I’m being cautious and limit the scope. Yes, you’re right – on a personal level it was hard for many, including some of my closest blogging friends. And I can definitely sympathize with them, as 2011 ended up being a tough year for me, and I think I was just happy that 2012 was a year where things turned around. Hopefully we’ll all have a good 2013! Every time I read your statistics I always am fascinated and vow to do the same, only to never get around to doing so. So I will just continue on loving yours :) I’m wondering if we can now call you a Chanel girl…although Guerlain girl sounds so much better! I’m with the Hound. I live them vicariously through you. Ah May Zing. I love that Guerlain was No 1. Guerlain was No 1 in testing but No 2 in wearing. Last year. We’ll see where it goes this year. I love your perfume stats. You put some much effort into them and they really look great. You must be a statistitian in real life lol. Thank you, Scent Bound. If I’d have to do statistics as my job I doubt I’d have had any strength or desire left to do it for my blog (and then I’d be bothered by the fact that my data sampling isn’t representative ;)). I’m an amateur. I hope you keep posting your stats, they are truly entertaining! You did very well on your resolution to get to know Guerlain! Thank you, Birgit. I was surprised myself when I realized how much Guerlain testing and wearing I’ve done. (whispering) I bought two bottles and several decants and was gifted one more bottle. I really envy you the energy and effort you put into your statistics (I could never be able to do something like that). And it was fun to go through your year round-up, I hope you keep it up. For someone who was very busy with many different things last year, in the end, I somehow ended up trying most of the interesting releases (for me at least) and if I go by that, it was a good year in perfume. I am certainly happy with the Neela trio, the new Lutenses and many others. I didn’t mention NVC’s perfumes because technically they were released in 2011 but I think it was a very strong start for the brand. I will keep collecting data of my testing/usage – that’s not even a question. My doubts are related to my ability to find interesting view at those numbers. But I’ll try. And you’re definitely getting my “blue” sample: as I suspected, this variation isn’t for me – the same as the original. I’ll be ordering decanting supplies in the next couple of days and we’ll coordinate the swap. But we can discuss all the details. 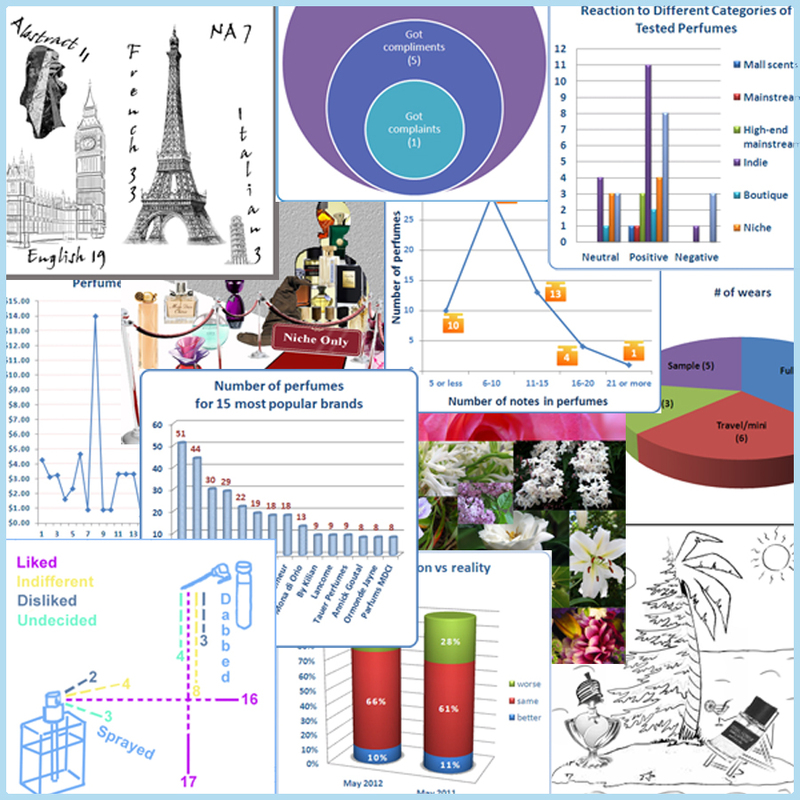 I’m so impressed by your statistics, plenty of work to organize and put all the information together. It’s really entertaining and formative to read. When it comes to 2012 I also think it was a very good perfume year and I (of course) hope 2013 also will be good despite the threatining EU-regulations. 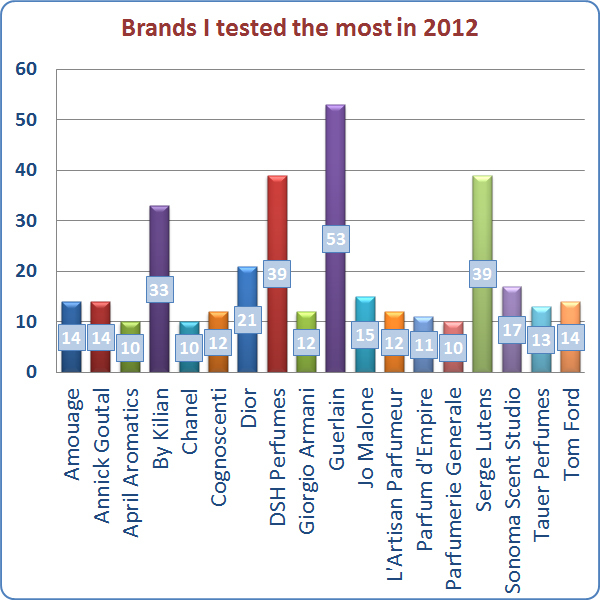 My best findings in 2012 was the Ramon Monegals, Opardu (Puredistance) and the Guerlain Les Deserts d’Oreint trio. And I also gone back to appreciate the classic Guerlains, Chanels, Rochas and Diors. Even if reformulated they are standing out from the crowd of current releases. Thank you, Parfumista. To tell the truth, most work goes into those pictures (graphic designer I’m not) numbers come easy since I regularly enter everything into my database. I’m really scared with those future changes. I feel like I should run and buy back-up bottles for most of my current favorites. It’s always amazing to see your stats. You’re so thorough and scientific about it. Thank you, poodle. I’m thinking about making it even more “scientific” by adding weather data. We’ll see if I implement it. Great post, Undina. Loved the illustrations and the releases you felt positive about last year. Even if they weren’t my thing, there was a lot of high quality perfume there. Equally enjoyed finding out your most worn perfumes of 2012. I have really come round to New Look 1947 and would contemplate a bottle next summer. I’m glad you like New Look 1947. I think it’s one of underappreciated perfumes. I hope it won’t suffer from re-formulations. Or, at least, you’ll get your bottle before those hit. I really must commend you on the charts. They are quite lovely! I’ve never looked at purfume that way. Nice stats and kudos for keeping up your data collection. My little crystal ball is thinking you’ll be a Guerlie Girl by the time you report on your 2013 stats! We’ll see :) I’m on my way there. Glad to see you here. And thank you for your kind words. 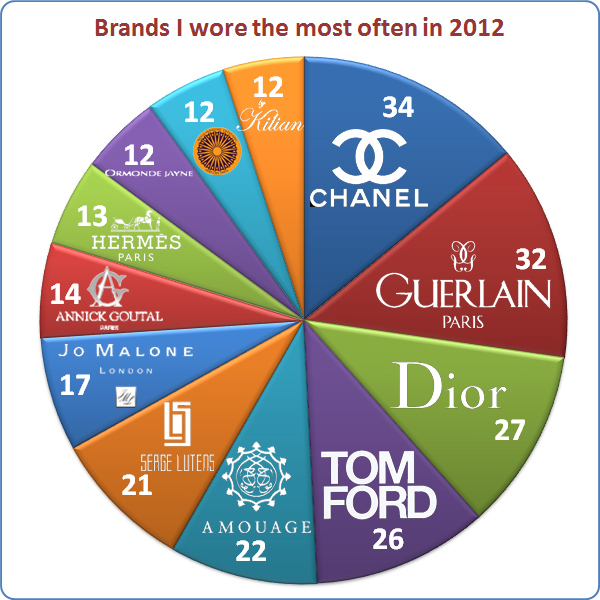 I wish you (and your brand) all the success in 2013. Speaking of the brand, is there a chance you’re planning on releasing smaller sizes? A purse spray (5-15 ml) or a discovery set of all three perfumes in 10-20 ml would be great! Even 30 ml bottles would make a lot of the difference. In the process of switching samples over to 2ml spray bottles. Have been looking at smaller bottles for the line for last couple of months. Haven’t found the right ones yet. Definitely in the works! I love reading your statistics. Always food for thought! It definitely inspires me to be more organized in 2013. I keep a notebook, but it’s pretty messy! Love these. Now I’m getting curious on what I wear the most and if it matches up with what I consider my favorites to be. Is there any possibility to figure it out? I haven’t kept those kind of records yet, but it wouldn’t be hard to start. If you do, please share the results. Great graphics and even more impressive record keeping behind the charts! I am glad to hear that you weren’t disappointed by the lemmings that you did get to try. I have still to marshal my thoughts on what I enjoyed in 2012, but I can see there will be a fair bit of crossover with your favourites, notably Nuit Etoilee, Grand Bal, Santal Majuscule and Seville a L’Aube. So is it fair if I decide to consider 2012 the “Year of Guerlain”? :) Because even if there are still no amazing Guerlain loves, its numbers are definitely rising, right? I’m surprised (always) by some of the numbers in your posts, so I hope you do decide to keep them up. I’m confident you can find an angle.